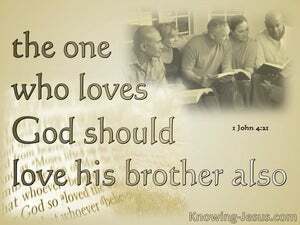 ﻿ 1 John 4:21 And this commandment we have from Him, that the one who loves God should love his brother also. And we have this command from Him: the one who loves God must also love his brother. And this is the commandment that we have from him: the person who loves God must also love his brother. And we have this commandment from him, so that he who loves God will also love his brother. And this command (charge, order, injunction) we have from Him: that he who loves God shall love his brother [ believer] also. And this is the [greatest] commandment [See Matt. 2:37-38] we have received from Him: [It requires] that the person who [claims to] love God should also love his brother. And this commandment we have from him: That he that loves God, must love his brother also. besides, 'tis a commandment we have receiv'd from him, that he who would love God, must love his brother also. Moreover, this commandment we have from him, that he who loves God, loves his brother, also. And we have this precept from him, that the one loving God with divine love also loves his brother with divine love. This is the command that we get from him, that whoever loves God must love his brother also. And this commandment have we from him, that he who loveth God, love his brother also. And we have this commandment from him, That he who loves God loves his brother also. And this command have we from him, That he loving God love his brother also. And this [is] the commandment we have from him: that the one who loves God should love his brother also. And we have this commandment from Him, that he who loves God should love his brother also. And this commandment have we of him: that he which loveth God, should love his brother also. And we get this command from him, that he who loves God is to love his brother as well. And we have this command from God: HE WHO LOVES GOD IS TO LOVE HIS BROTHER ALSO. And the commandment we have from him is this: that the one who loves God should love his fellow Christian too. 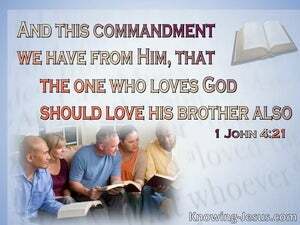 And this commandment we have from him, that he who loveth God love also his brother. And we have this commandment from him, that he who loves God should also love his brother. And, this commandment, have we from him, - that, he who loveth God, love, his brother also. So this commandment have we from him, that he who loveth God love also his brother. And the command which we have from Him is that he who loves God must love his brother man also. This is the command that we get from Him, that whoever loves God loves his brother too. And this commandment we have from Him, that he who loves God loves his brother also. And we have this commandment from Him, that he, who loveth God, should love his brother also. and this is the command we have from Him, that he who is loving God, may also love his brother. 20 If someone says, "I love God," and hates his brother, he is a liar; for the one who does not love his brother whom he has seen, cannot love God whom he has not seen. 21 And this commandment we have from Him, that the one who loves God should love his brother also. And he said, "The one who showed mercy toward him." Then Jesus said to him, "Go and do the same."